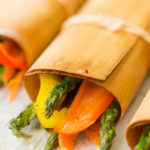 Cedar wrapped vegetable bouquets are made with herb butter coated asparagus, carrots, and bell peppers, arranged in a cedar wrap and roasted in the oven. Sponsored by Fire & Flavor. My favorite kinds of recipes are the ones that look extremely elaborate when finished, but are in fact very simple to accomplish. Cedar wrapped vegetable bouquets fit the bill. I used a really fun and versatile product to pull this off: Fire & Flavor Cedar Wraps. 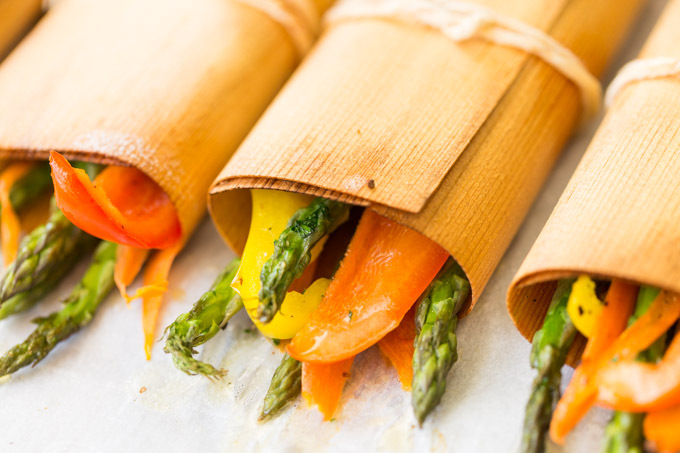 Cedar grilling wraps, or grilling papers (as they’re also known), add a subtle smoky flavor to vegetables, meats, seafood, and even fruit. They can be used on the grill, on the stovetop, or in the oven. 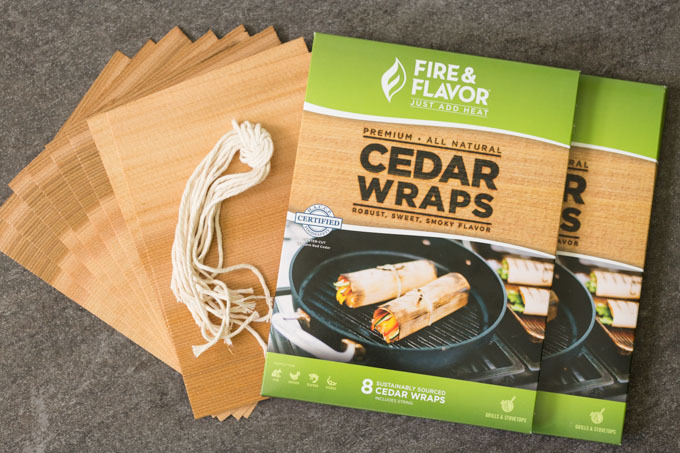 Fire & Flavor Cedar Wraps include the wraps plus handy cotton kitchen twine for tying the wraps; recipe ideas are also included inside the package. All you have to do is soak the wraps in liquid. You can simply use water—or use wine, sake, or bourbon for extra flavor. For this recipe, I used white wine. I selected asparagus, bell peppers, and carrots for this bouquet, but many kinds of vegetables would be suitable for cedar wrapping. All you need to do is make sure that they’re cut to the proper size and thickness so that they cook evenly. For example, instead of slicing carrots into rounds or sticks, I used a vegetable peeler to shave long, thin strips of carrot. That’s how I made sure they would cook at the same rate as the faster-cooking bell peppers and asparagus. Then, just arrange your chosen veggies inside the soaked cedar wraps, drizzle them with herb butter (I used fresh parsley, but feel free to experiment), and season them with salt and pepper. Each bouquet is tied with one piece of included kitchen string. Voilà! Elegant cedar wrapped roasted vegetable bouquets. The vegetables turn out crisp-tender, with a delicate flavor that tastes especially fresh—like they’d just been picked from the farm. Once you’ve mastered this technique, you can use cedar grilling wraps to make Cedar Wrapped Asian Salmon, Cedar Wrapped Shrimp Tacos, or even Smoked Adobo Chicken Tacos. 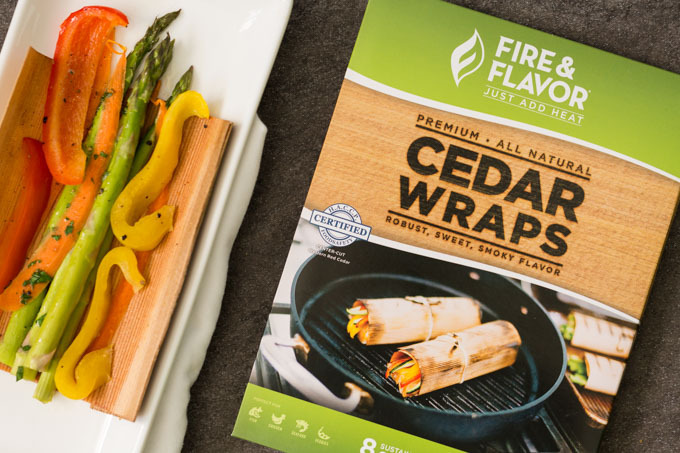 Shop for Fire & Flavor Cedar Wraps here. 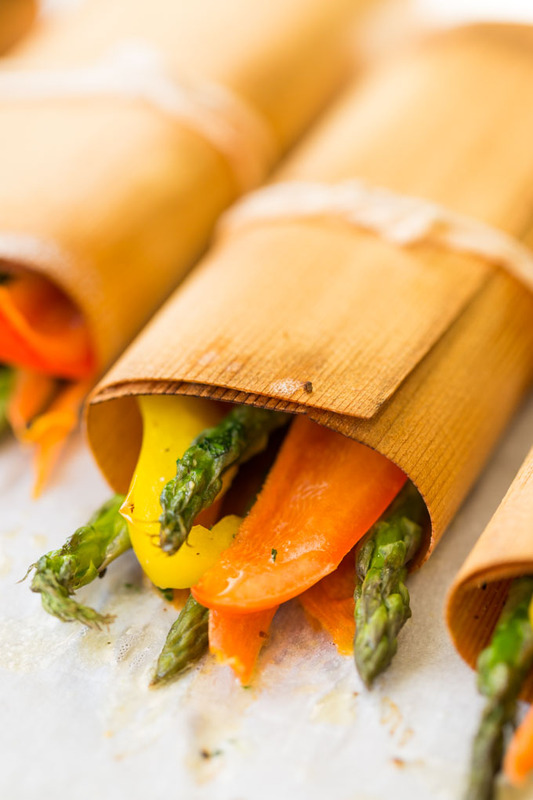 Herb butter coated asparagus, carrots, and bell peppers, arranged in a cedar wrap and roasted in the oven. Preheat oven to 400 F. Prepare the cedar wraps by soaking in white wine for 10 minutes. Trim the woody ends from the asparagus and slice the bell peppers. Use a vegetable peeler to shave long, thin slices from the carrot. Stir the chopped parsley into the melted butter. Lay out the soaked cedar wraps and divide the vegetables evenly between them. 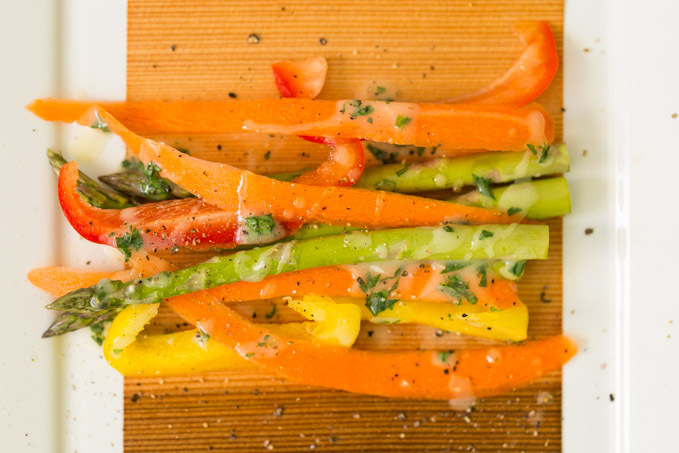 Drizzle the vegetables equally with herb butter, paying special attention to any exposed ends that stick out from the wrap, then season with salt and pepper. Close up the wraps and tie each one with kitchen string. Place on a baking pan and roast in the oven for 15 minutes, or until vegetables are crisp tender. 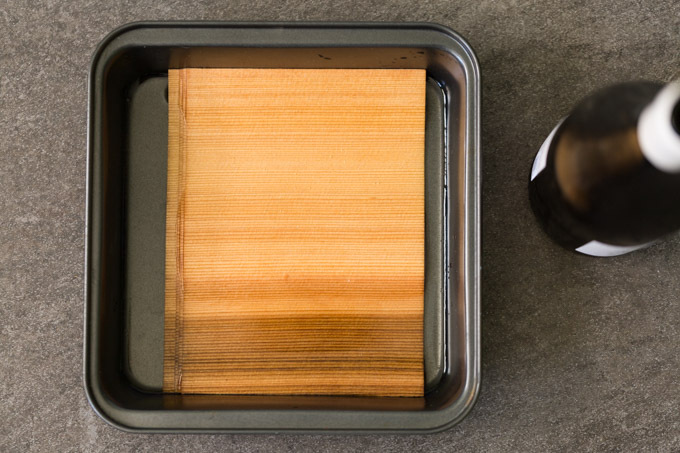 Check out my related tutorial on how to make cedar plank salmon in the oven. Wow this is something cool! I would definitely love to try this! I bet it tastes delicious after coming out of the oven! Looks so delicious. Never heard of this but I would definitely love to try it. oh wow! I love the idea of wrapping the veggies up in cedar paper! That’s great! We love grilling and I will definitely try these next time! Wow! This looks delish! I love that it is easy to make. So, this is a different way to roast your veggies? I am in! I will have to check this out and give it a try. My son likes when I roast veggies! This looks delicious and healthy! I have never thought of using a cedar wrap for vegetables. I will definitely be trying this recipe in the future. Oh wow…. i bet those are delicious cooked in the cedar wraps! I am obsessed with the scent of Cedar for sure and I would love to get these and use when I am cooking Salmon. YUM! Now that’s a new dish!! I would love to try this! This is interesting. It’s my first time to know about cedar wraps. Looks creative and colourful. I’ve never used cedar wraps but I should give it a try. From the photo, it looks so delicious. Thanks for the recipe. I’ve been a vegetarian for more than 20 years and I am always looking for different ways to switch things up. Thanks for sharing this recipe because I love asparagus. This is a must try. This looks fun and I can see how it see how this could be adapted to other vegetables.